Vespa scooters aren’t oriented towards performance. It’s more like a style-statement that represents fan following and desire for something else, something new. While other scooter brands move more towards edgy and sporty design, Vespa still flows through the classic curvy design. This is what makes the Vespa different, this is what makes it stand out from the crowd. D-Lifestyles is the authorized distributors of Vespa scooters for Nepal. 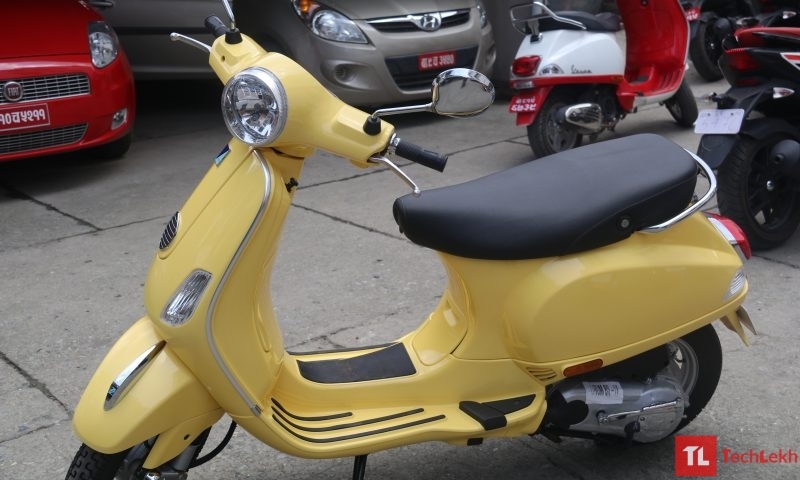 Currently, 5 different models of Piaggio Vespa scooters are on sale in the Nepali market. Each model also further categorized into two variants based on its engine; 125cc and 150cc, except two model, the Vespa Elegante and Vespa Notte. This brings the total variant of Vespa scooters available in Nepal to 8. So, without further delay let’s jump into the list of Vespa scooters price in Nepal. LX 125 comes with all the classic coolness of the brand along with the modern touches. Staying true to the aerodynamics of the old classic, the design will attract many to go head over heels. It embodies the simple-looking original design. The theme includes curvy body panels with chrome finish, round headlight, and a slightly forward leaning stance. List of modern features like electric start, front disc brake, single piece analog instrument cluster, and plain digital clock are included. Like all scooters, it comes with ample storage. The motor is responsive in city traffic and the riders don’t have any places to complain. While some scooters offer telescopic shock suspension, LX 125 comes with modern single side arm hydraulic suspensions. The 150mm front and 140mm rear drum brakes do the job, though disc brakes would’ve been preferable. 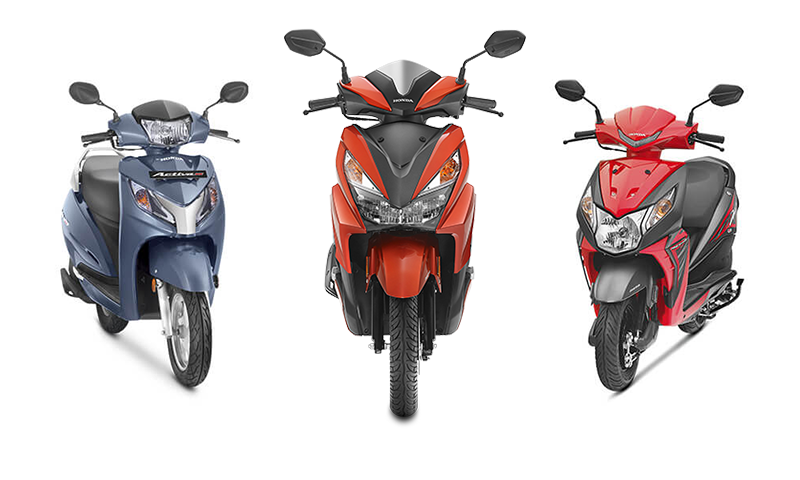 The LX125 goes head-on against the scooters like Suzuki Access 125, TVS NTorq 125 and Honda Activa 125. Although the competition is relatively affordable, none can beat the Vespa in terms of design. Vespa VXL 125 is the all-new facelifted VX 125. Like several others Vespa scooters, it hosts Italian design with superior craftsmanship. Furthermore, it comes with a list of new upgrades like cosmetic, larger fuel tank, and bigger tires. The unique design includes a new paint scheme, V-shaped grille, 5-spoke chrome alloy wheels, improved digital instrument cluster, and much more. It continues to draw and perfect the design inspiration from its retro parent. VXL 125 is built on the single piece steel monocoque chassis where the engine is offered with a CT gearbox. Also, the broader tires will drastically improve the overall riding dynamics. It is equipped with front disc and rear drum brakes. Additionally, Vespa will offer another list of personal accessories like a bumper guard, visor, and a perimeter kit. Thanks to its unique design, performance, and core Vespa experience, it rides high from all the competition. The Italian word for the night is “Notte”. Vespa Notte takes it home with the name, with blacked out everything. You’ll get the entire bodywork cloaked in matte black with no sign of chrome anywhere. In this list, I placed Vespa Notte just after VXL 125 because the performance is identical. The only key difference you’ll likely notice is the cosmetic enhancement. Vespa VXL is also available with the 150cc engine. It is the most powerful version of the VXL 125 scooter. Riders get access to more torque and power at their disposal. Rest of the experience, design element, suspension, and chassis are the same as its less powerful sibling. There aren’t a lot of 150cc scooter in the market right now. 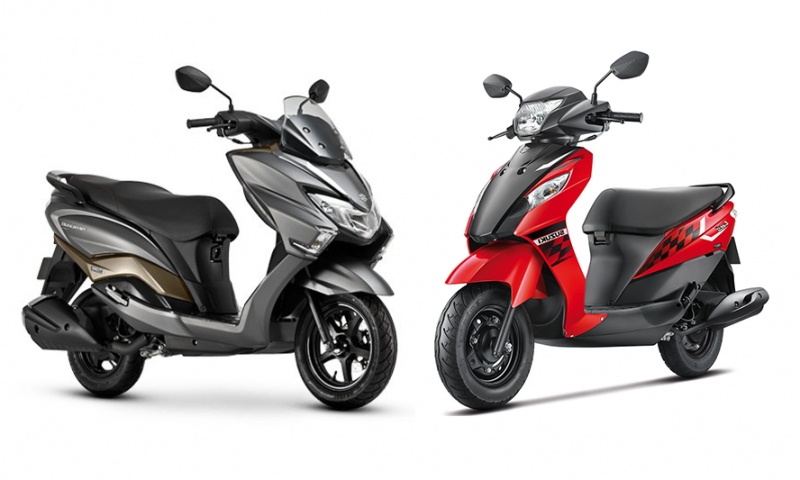 Although, Vespa VXL 150 does have a head to head competition against Aprilia SR 150. Since both are owned by the same company, the competition is simply negligible. Vespa brings in refreshed design in SXL 125. Being a little more premium 125cc model in the Vespa scooter line-up. The core design can still be seen that tunes it with the retro look. It comes with all-new instrument cluster along with an electronic display, new paint schemes, and a new mode button on the switchgear. There is also a more visual difference in SXL. Headlamps and mirrors get a more squared design whereas the alloy wheels are fully blacked-out. Another interesting difference is the broader tires. Vespa shares a lot of elements with each other. Things like suspension, chassis, and CVT gearbox remains the same. It’s mostly because Vespa shares its components with the rest of its scooter line-up. Although, Vespa SXL looks more appealing in terms of looks thanks to its rectangular headlamps and premium chrome finish. This Italian build is top notch without any compromise in quality. Vespa SXL 125 is available in ‘Matte’ color scheme. However, the customer will have to pay a tat bit extra to get the scooter in that color scheme. I will assure you that the ‘Matte’ color scheme looks phenomenal! Vespa SXL is also available with a much powerful 150cc engine. It is like its sibling SXL 125 scooter, with the difference in performance. Riders get access to more torque and power at their disposal. Rest of the experience, design element, suspension, and chassis are the same as its less powerful sibling. Like Vespa SXL 125, SXL 150 is also available in ‘Matte’ color scheme. However, the customer will have to pay a tat bit extra to get the scooter in that color scheme. I will assure you that the ‘Matte’ color scheme looks phenomenal! Moving on to the end of the list, its Vespa Elegante. Vespa scooters are all about the attitude, and none proves it other than Elegante 150. Making its way onto the list, the most expensive scooter in the Vespa. Taking design inspiration from VXL 150, it features powerful a 150cc engine in an attractive Vespa body. The design sports a new front fascia that complements its round headlamps and mirrors. Compared to other Vespa scooters, it sports bigger 12-inch alloy wheels. It also comes with a perimeter guard, tinted fly screen, chrome plated guards, and a two-piece “designer look” leather seat. Vespa Elegante is all about the style. The total model of Vespa scooters currently available in Nepal is eight. However, this is expected to grow in the future with new Vespa models making its way into Nepal. When that happens, we’ll continue to update this list of Vespa scooters price in Nepal.